Sometimes you catch a film critic calling a summer movie “…a real ride!” Which sort of leaves us in an awkward position when Disney releases a movie that actually is a ride already. Perhaps we should say that the theme park attraction is a real movie. Of course it is, in a way; that was Walt’s original intention with it, and why the powers that be have tried to adapt it to film. 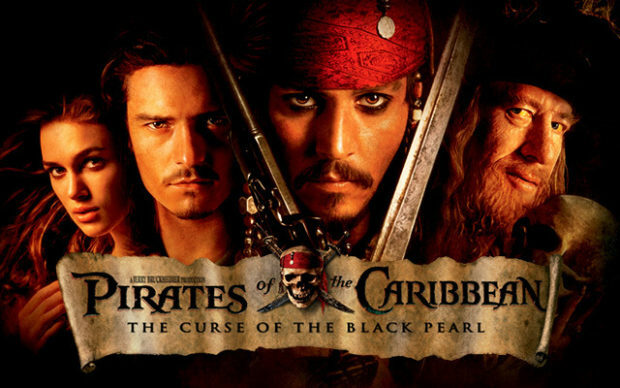 The result, subtitled The Curse of the Black Pearl, shares subject matter and a few fairly subtly done visuals. But luckily, it owes more to the swashbuckler tradition of old than to animatronics, even with a blandly mechanical pretty boy near its center. Screenwriters Ted Elliott and Terry Rossio, who have had some experience in the genre with The Mask of Zorro, have melded the best elements of the attraction with old-fashioned storytelling. And though it might stand a little cutting, Pirates of the Caribbean at least has both thrills and wit about it. Headlining the action, Johnny Depp cuts a dashing but unconventional figure as Jack Sparrow – he has to keep insisting on the title “Captain.” When we first see him, he stands proudly on the mast of his ship, which the camera pulls back to reveal is itself neither proud nor no longer seaworthy. By the time he reaches the island colony of Port Royal, his boat has submerged, and he prowls the docks for a vessel worthy of commandeering for a voyage of vengeance. Unfortunately, he’s not the first character we meet. 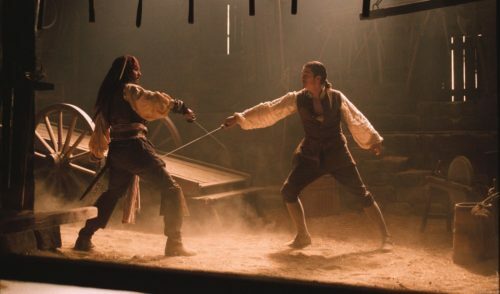 Before him lies the film’s young lovers, Will Turner (Orlando Bloom) and Elizabeth Swann (Kiera Knightley), daughter of Port Royal’s governor (Jonathan Pryce). Their love remains unspoken, and worse: for political and social reasons Elizabeth appears fated to marry the uptight Commodore Norrington (Jack Davenport). Clearly, Governor Swann is oblivious to the obvious love connection from the moment he rescued the shipwrecked orphan Will from the sea years earlier. At the time, the only clue to Will’s past was a curious gold coin on a chain around his neck, which the pirate-obsessed Elizabeth stole while the boy was unconscious – eventually much to both their dismay. It sounds a little complicated, and that’s a good thing. The filmmakers may be making a popcorn movie, but they trust that their audience is smart enough to follow what’s happening. If the lovers themselves are a little less than riveting, it’s only because they have such a magnetic rogue in Jack Sparrow. He has a connection to the gold coin, too, but what is best left to be discovered by the audience. Suffice to say that when the mythical black pirate ship The Black Pearl appears at Port Royal, Sparrow appears to be the only one not surprised. And when the motley crew transform into skeletons at the touch of moonlight, he can only muse, “interesting.” Perhaps Sparrow is as insane as Norrington believes, but it wouldn’t be much of a story if there weren’t more to it than that. Captain Barbossa of The Black Pearl (Geoffrey Rush) takes Elizabeth hostage in the pirates’ raid of Port Royal. When Will gets shut out of rescue plans, he turns to the only man he knows has a clue to their adversary: Sparrow. Moreover, Depp and Rush prove worthy adversaries. Both of them obviously relish their roles. Depp plays Sparrow as a man who has been in the sun too long (as local legend suggests), and there’s little difference between the character drunk and sober. Even by the end of the film, it’s unclear how much of Sparrow’s behavior is an act, but it doesn’t matter. Whenever Sparrow is onscreen, he commands it. Yes, throwing Sparrow into the mix with Will, Elizabeth and Norrington makes for a romantic quadrangle, but it’s really clear that if Elizabeth has half a brain, she’d dump the island boys for the lusty rogue, even if he is wearing better eye make-up than her. Before the film can explore the idea, Verbinski and crew shy away. If Rush seems somewhat restrained, it’s only because he has to act around the handicap of continually turning into a corpse. His Barbossa is a man desperate to fill his lusts, an act made impossible by the curse attached to the gold. Even when not caught in moonlight, Barbossa wears the look of evil. He seeks an end to his curse, but has no desire to seek redemption. There’s poignancy to the curse, however, mostly shown in little throwaway bits with the crew of the Pearl. Some work, but Rossio and Elliott have overdone things on the comic relief. It’s a problem with modern action films in general; it’s not really relief if you haven’t built up tension in the first place. In particular, a bumbling pair of spectral buccaneers seems to have wandered in from one of Disney’s lesser comedies from the sixties. Or maybe from the ride itself, but it’s one of the transplants that doesn’t work. If anything, in fact, Verbinski overuses the effect. Just as the movie takes its time getting started, so do the fight scenes tend to meander. The climactic battle is impressive on all levels, until it starts repeating itself. But it’s still cool to see pirates dashing in and out of the moonlight, transforming seamlessly back and forth. So dare I say it? The Curse of the Black Pearl is a great ride, with the occasional slow moments. But should Depp want to return to the role of Captain Jack Sparrow, it’s a ride I’d gladly take again – with a different subtitle.